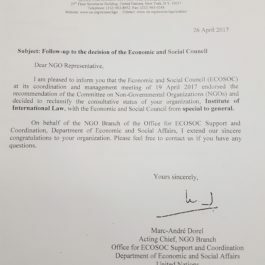 In 2017, the consultative status of the Institute of International Law with the Economic and Social Council has been reclassified from special to general. This means that the Institute is considered as an organization that is ‘concerned with most of the activities of the Council and its subsidiary bodies and can demonstrate to the satisfaction of the Council that they have substantive and sustained contributions to make to the achievement of the objectives of the United Nations in fields set out in paragraph 1 above, and are closely involved with the economic and social life of the peoples of the areas they represent and whose membership, which should be considerable, is broadly representative of major segments of society in a large number of countries in different regions of the world shall be known.’ (Para 22 of ECOSOC resolution 1996/31). This consultative status allows members of the Institute to sit as observers at public meetings of the commissions and other subsidiary organs of the Council as authorized representative of the Institute. More information can be found on the website of the NGO Branch, Office for ECOSOC Support and Coordination, UN DESA, including the calendar of upcoming events. For information about the events in Geneva, please visit the website of UNOG. The Institute participates as observer to meetings organized by the Hague Conference on Private International Law. The next meeting on the Judgments Project will take place in The Hague from 13 to 17 November.